This is one of my favourite places. There is a little sliver of Lake Ontario in the first image, and the sand and dunes you see here are part of the worlds largest freshwater sandbar. I remember clearly the first time I put my feet in this sand. It was the summer I was 16. That’s a while ago. Cinematic drama but better Karen! Gorgeous, the contrast, textures, composition! Thanks very much, Elena. It’s a great subject! Wow these are beautiful! You know Karen they kind of remind me of an old Western film. That’s interesting, I hadn’t thought of that but I guess I could see what you mean. Thanks, Allen! I had to ask myself where? 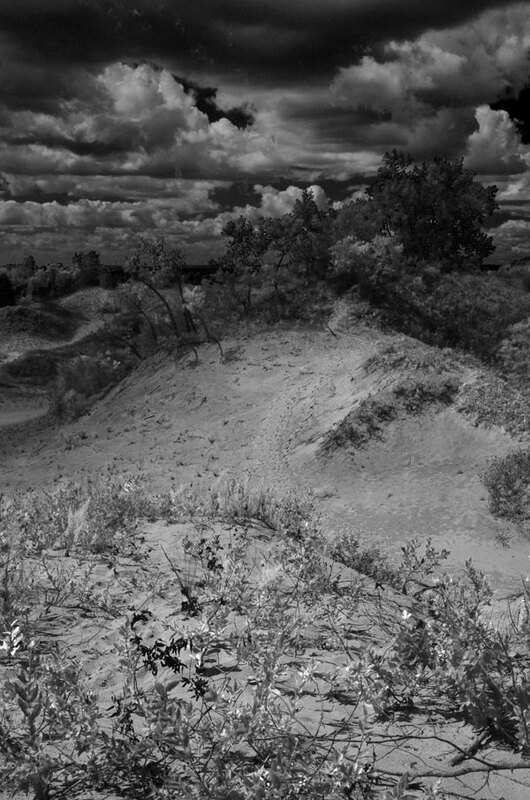 I had heard there were sand dunes near Lake Ontario but have never seen them and I am from there! These are so dramatic; even ominous. I think the first three and the last are the most powerful. The first one is so mysterious, leading you in, way in. Gorgeous. Thanks Judy, this is near Picton, On. A truly beautiful area if you get a chance to visit! Bare feet in the sand dunes at 16, that must be a great memory. Wonderful work with these in B&W Karen. Ah yes, Bente, I loved this place immensely from the first time I set foot in it. I’ve been back many times and it still fills me with wonder. Thanks! Feels like someplace I’ve never seen or been. Some very distant and foreign landscape in another time. Beautiful images. Like an electrified memory. A landscape of the mind…? Thanks for your great comment, Steven. Tremendous views of this amazing location Karen. Thanks so much, Phil, I’m glad you think so. 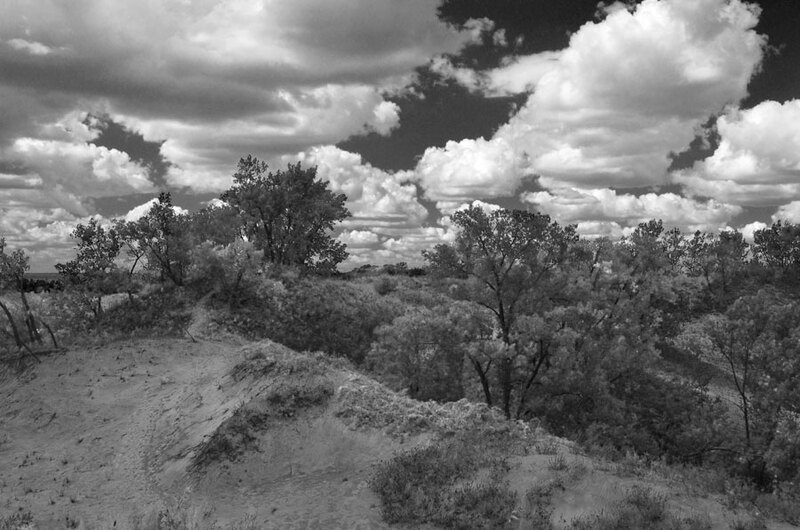 Incredible heightened drama…like Ansel Adams on infrared or something! 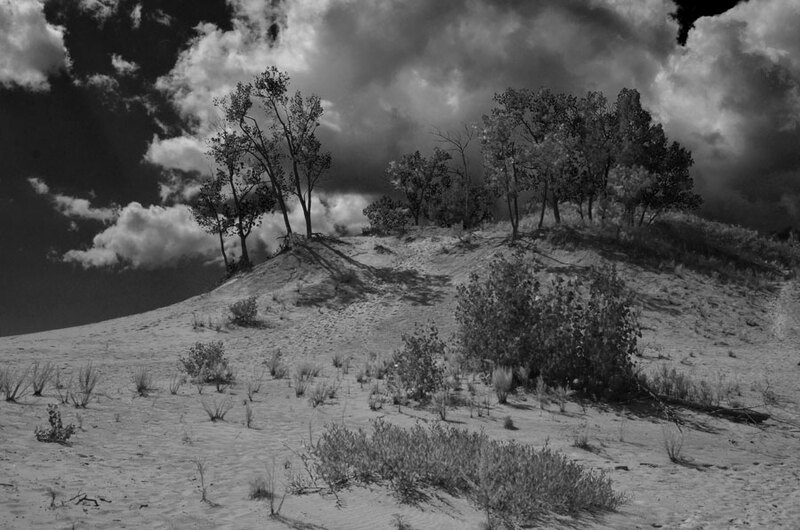 Reminds me of Silver Lake off Lake Michigan…dunes 100 feet high that bury all but the tops of the poplars. We used to go Dune Scooting as kids with a tour buggy outfit that’s been in business since the 1950s. 4 generations of my family have done this! Dune scooting sounds like fun! Those are the kind of memories you hold dear forever. Thanks for your comment, Scilla. These are wonderful. The tones and textures are perfect. I’ll go so far as to say, Karen, that these are magnificent, especially the first one. That’s a lovely comment, Ashley. Thank you. Wonderful depth of tones in this set, Karen. A beautiful spot that evokes lovely memories for you. I like the deeper sense of drama- well done. Thank you, Jane. Yes, years of amazing memories here. Yes, we are small, and nature is huge and beautiful! This looks like an amazing place. 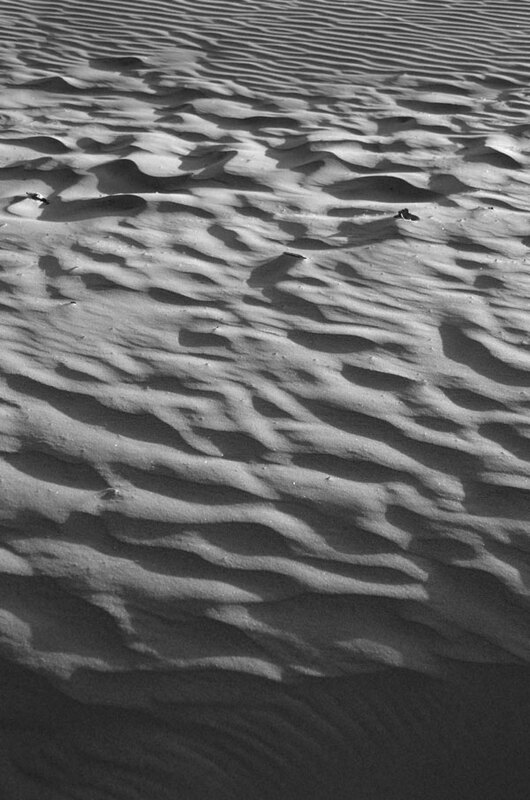 Makes me hunger for a bit of dune time – a few days at least, in good light. It’s a really beautiful place. I’d like to photograph it in winter. There is some interesting history about this place too – about how over 100 years ago all the trees/vegetation were removed from the dunes and the surrounding farmland was swamped with sand. It took decades to re-stabilize the sand dunes! Now that is not surprising, they they would get on the move again if no longer anchored by vegetation. I have recently been working with Lidar images from a heavily forested environment near a northern river. Lidar works via a phenomenally dense array of laser beams projected from an airplane. The beam reflections are measured which gives a map of the vegetation but also of the ground where the light reaches through. If you are not a forester, then you strip off the vegetation data leaving a very high resolution map of the ground under the forest. Anyway, in this area, near the river and near the edge of a glacial lake there are all kinds of sand dunes visible on those maps under the forest. If they were exposed again, they too would start to move even though anchored for thousands of years. Very dramatic Pictures very David Lynch like.Well done Karen. Stunning black and whites Karen. It looks like a great place to visit and photograph. 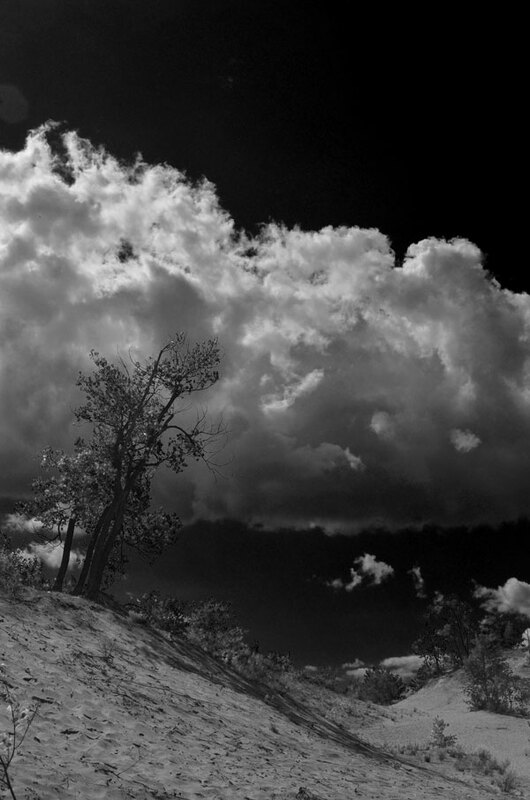 Compelling images in bnw! The clouds show up with huge presence and the sand looks as soft as talcum powder? Dramatic landscapes, dramatic skies – perfect combination. CONtrast! Images three and four remind me of a Twilight Zone episode I watched once. Three could be right out of a B&W version of Lawrence Of Arabia. The B+W changes the mood totally. I expect in colour they would be happy sunny shots, but instead they are very dark and moody, almost threatening. Very interesting effect. A place evoking strong emotions… or is it, your pictures doing that?!!! A fine collection – powerfully dramatic, enhanced by the use of B&W. Very dramatic ! Love that second one. black and e white is so elegant here. I love it that your blog can take us from the intimacy of a seed head to the grandeur of these landscapes. I really like the epic sweep of these. Beautiful in black and white. Gorgeous, powerful, images. Really nice work! You are a sweetheart. : ) Yes, not much has changed really in that 4 years, although, I suppose the dunes are resculpted by the winds daily. Beautiful photos, Karen…love the drama in the sky and the way you finished/processed the images…like taking us back to the time when you first saw them…. Oh to be 16 again! 🙂 Beautiful and dramatic images. They work so well in black and white. I saw these before and now have seen them again. Mindblowingly beautiful. Stunning. Have you been there (Sandbanks Provincial Park, Picton)? It’s not far from you. Perhaps some time ago. I’ll need to see it again with these images in mind. I really appreciate how you have seen and shown this.